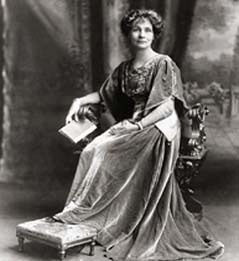 Emmeline Goulden was brought up in a middle class family in Manchester, England. She enjoyed the privileges of a holiday home, piano lessons, and four years schooling in France. Her parents were liberal thinkers, her mother was a keen abolitionist, and both were supporters of equal suffrage for men and women; in fact, the beautiful Emmeline was only fourteen when she attended her first suffrage meeting (1). After returning from a second stay in France, she fell in love with Richard Pankhurst, a radical lawyer devoted to the cause of women’s suffrage who was twenty-four years older than she. Although a “free union” was what she proposed, they were married in 1879 (2). Revolutionary ideas were not new in England. In 1792 Mary Wollstonecraft had written in her famous Vindication of the Rights of Women that it was time that they had “power over themselves” and that there should be “a revolution in female manners …to make them, as part of the human species, labour by reforming themselves to reform the world (3).” In 1832, Harriet Smith petitioned Parliament for propertied women to vote for members of Parliament (4) and John Stuart Mill followed suit in 1866, strongly influenced by the ideas in his American wife Harriet Taylor’s book The Enfranchisement of Women. 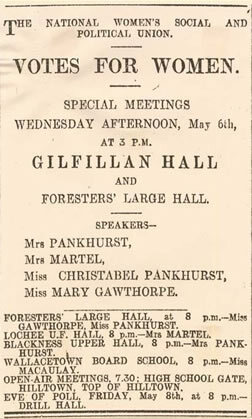 In 1869, in an amendment drafted by Emmeline’s husband Richard Pankhurst, English women gained the rights to municipal suffrage (5). Emmeline gave birth to four children in rapid succession, Christabel in 1880, Sylvia in 1882, Frank in 1884 and Adela in 1885. After Frank’s death in 1888, Henry was born a year later but his mother nearly died in childbirth. (6) Both parents always put their political beliefs first, which caused severe economic hardship, yet the two eldest children followed their example. In order to be at the center of politics, the family had moved to London and Emmeline became a keen political hostess, helping to found the Women’s Franchise League in 1889. Financial problems forced the family’s return to Manchester, where Emmeline worked in local politics, for she believed that women had a special contribution to make in social reforms (7). Both she and Richard joined the International Labour Party (ILP). 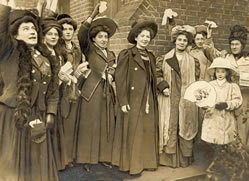 Mrs. Pankhurst, September 1909, sixth from left. 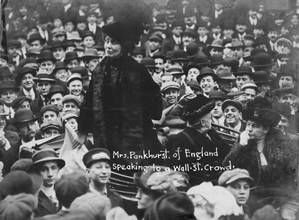 caption: "Mrs. Pankhurst speaking to a Wall Street crowd." The WSPU began with civil disobedience, demonstrations, and marches, and then on November 13, 1910, “Black Friday” occurred, the first real suffragette riot. This march on Parliament lasted for six hours during which time the police assaulted women physically and sexually (10). Emmeline called for more strident measures, and stone throwing and window smashing occurred, followed by arson and sabotage. Arrested innumerable times, she used hunger and thirst strikes to gain public sympathy. 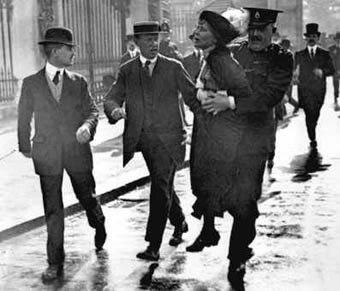 Between April and June of 1913, she was rearrested nine times, hunger striking at each imprisonment (11). The same year, the first and only martyr, Emily Davison threw herself under the hoofs of the king’s horse, and artwork was slashed in Edinborough. Then war broke out, Emmeline suspended all operations during the four years of World War I, and actively recruited women for the war effort. 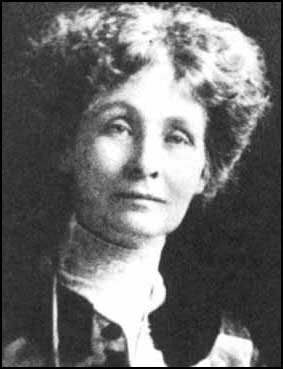 Emmeline Pankhurst: "Votes for Women"